Hanami is one of Japan’s most ancient festivals, but it’s celebrated as enthusiastically today as ever. Hanami literally means ‘flower viewing’, but in practice it usually refers to picnicking in the vicinity of cherry blossoms. This might not sound anything special to you, but the coming of the blossoms signifies the start of spring, and is much anticipated in Japan. Excitement starts to build in the weeks before the flowers bloom, as plans are made for parties welcoming their arrival. 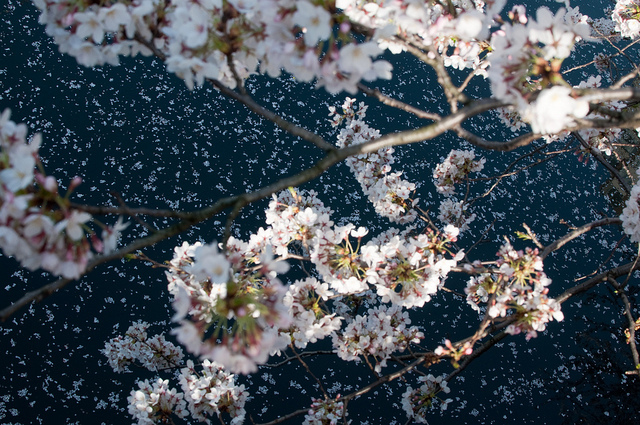 Hanami has its origins in the eighth century, and originally focused on plum blossoms, which bloom slightly earlier. The focus switched to cherry blossoms during the ninth century reign of Emperor Saga, who held flower-viewing parties under the cherry blossom trees of the imperial court in Kyoto. At these early celebrations, aristocrats wrote and recited poems about the blossoms, and took pleasure in their beauty. Hanami gradually spread from the court elite to the samurai, and eventually to the common people. Nowadays almost everyone in Japan eagerly looks forward to the coming of the cherry blossoms. Hanami at Shinjuku Gyoen National Garden, Tokyo. Signs at the entrance tell you that you’re not allowed to take alcohol into the park, but no one seems to take the slightest bit of notice. Shinjuku Gyoen is famous for having a range of different types of cherry blossom tree, some of which bloom earlier or later than the most common varieties, so it’s especially worth visiting if you miss the main cherry blossom season. 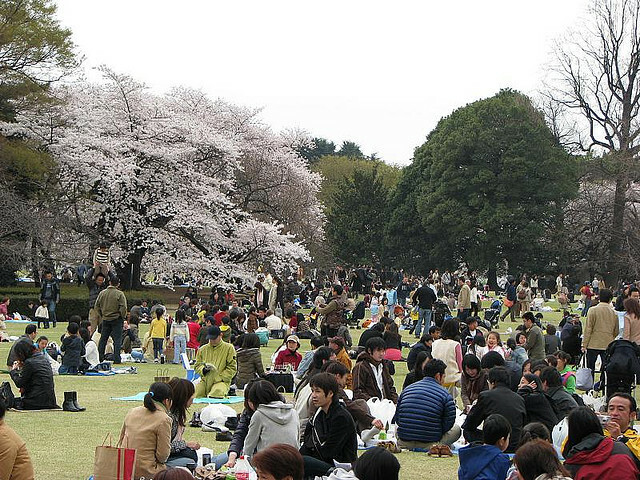 For some hanami is just a stroll in the park, but most people organize a picnic with their friends or colleagues. In parks, on riverbanks, and anywhere else where cherry blossoms are to be found, you’ll see groups of people sitting around eating and drinking. The most popular spots become so crowded that there’s hardly a speck of empty ground to be seen. Sometimes companies will send their most junior employees to reserve a space for an after-work party, so you might see young men dressed in business suits sitting around in a park all day, waiting for their colleagues to turn up. Drinking was a part of hanami from the very beginning, but for many people it has now displaced some of the more refined aspects of the celebration. Some people do make a big effort to admire the beauty of the cherry blossoms, often taking photographs of trees or individual flowers, but not many people write or recite poetry at hanami parties anymore. It’s often said that most people are really only interested in eating and drinking, and that the cherry blossoms are just an excuse for a big party. The festivities certainly tend to be a bit wilder than the word ‘picnic’ might suggest, and older people are often put off attending by the frequently rowdy nature of the celebrations. Many parks are lit with paper lanterns during the cherry blossom season, and the revelry often continues until late at night. 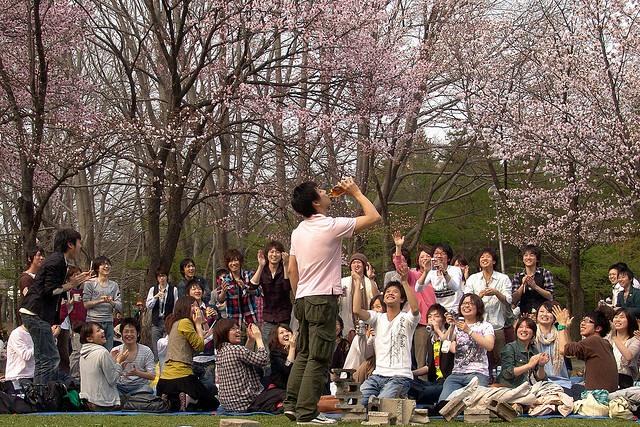 Hanami parties can include singing and dancing, and sometimes turn into raucous drunken affairs. 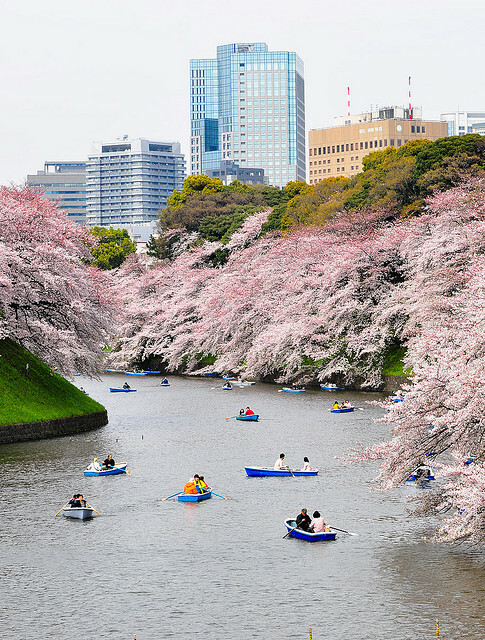 Taking a boat out on the moat of the Imperial Palace in Tokyo makes a great alternative to the more conventional hanami picnic. While you might think that flower-themed parties are a bit effeminate, this doesn’t seem to worry Japanese men. Perhaps it’s because Japan has such a longstanding tradition of actively appreciating the beauty of nature, but for one reason or another, hanami seems to be just as popular with men as it is with women. Most people make do with a ground sheet and a few cups and plates, but others are very well equipped, taking along chairs, tables, barbecues, stereos and even karaoke machines. If you don’t want to make your own picnic, you can buy ready-made hanami lunchboxes. These are like regular Japanese boxed-lunches, but with a few special hanami features. There’s an emphasis on white and pink coloured food, and sometimes the vegetables are cut into flower shapes, or seasonal ingredients are used to create the ‘taste of spring’. A kind of rice cake called ‘sakura mochi’ is made especially for hanami parties. It contains red bean paste, and is wrapped in a leaf from a cherry blossom tree. The exact recipe used varies from one part of Japan to another, but the leaves are pickled in salt water, which when combined with the cake itself, results in a very unique flavour. They’re not exactly to everyone’s taste, but are worth experimenting with if you enjoy novel culinary experiences. While most people head to a local park for their hanami party, it’s also popular to make a special trip to a famous viewing area, or to attend an organized hanami festival. Scenic spots such as castles, temples and shrines are popular destinations, as is taking a boat trip to view the blossoms along the banks of a river. Some people even go to see a single tree that is particularly famous. 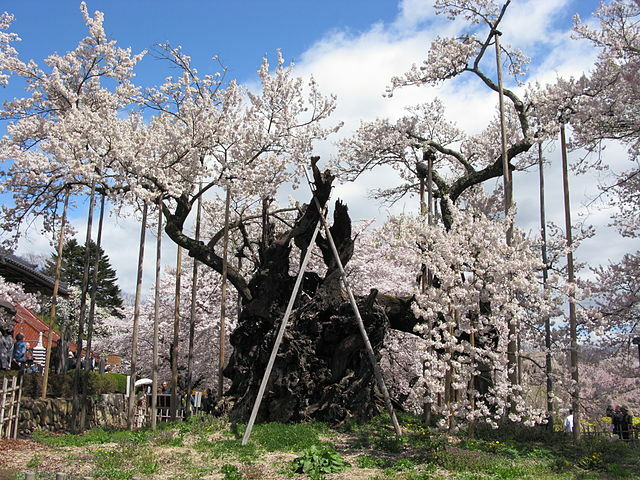 This is the Yamataka Jindai in Yamanashi Prefecture, the oldest cherry blossom tree in Japan. It’s of the particularly long-lived Edohigan variety, and is thought to be around 2,000 years old. The poles are there to prop up the branches, which might otherwise not be able to support their own weight. The Yamataka Jindai is carefully tended, and still blooms reliably every year. Cherry blossoms come out as early as late January in the southernmost islands of Japan, but they don’t bloom in the big populations centres such as Tokyo and Osaka until late March or early April, and not until May in the far north of the country. Newspapers and the TV report on the progress of the blossoms, and predict when they will come out in each part of the country. The flowers reach full bloom about a week after the first blossoms open, and will be falling after another week or so, though wind and rain sometimes finishes them off sooner than that. The special attention paid to cherry blossoms is often attributed to their fragility and short lifespan. They’re seen as an analogy for human life, reminding us of our human vulnerability and encouraging us to make the most of our short lives. Then again, their popularity could be more to do with aesthetics – whether seen close up as a single flower, or from a distance as a pink and white cloud, cherry blossoms are exquisitely beautiful. Perhaps best of all is the end of the season, when the petals fall like snow whenever there’s a gentle breeze. This man in Maruyama Park in Sapporo is drinking to celebrate having smashed the concrete blocks at his feet with a karate chop. The rest of the group seem to be enthusiastically encouraging him to drink the whole bottle, so I think this is going to turn into quite a wild party. If you do get the chance to attend a hanami party, here’s an important piece of advice: It will be cold. Like really freezing. The beginning of spring really is a bit early in the year for picnics – especially ones that keep going into the evening – so be sure to wrap up warmly and wear at least three pairs of socks. You’d also be well advised to get some of the chemical heating pads called Hokkairo. They’re sold in convenience stores all over Japan, and once they’re exposed to the atmosphere, they give off heat for a period of several hours. They’re particularly good for keeping your toes warm if you stuff them in your shoes. Hanami has started to become popular overseas, especially in other parts of East Asia and the USA, so you might be able to find a cherry blossom festival without going to Japan, or you could just organize your own event wherever there are cherry blossoms. And if you’re in Japan in autumn not spring, you could try experiencing momijigari instead. It’s a festival similar to hanami, but it focuses on appreciating the beauty of autumn leaves. I’ll leave you with a poem by the ninth century poet Ki no Tomonori – he expresses the true spirit of hanami better than I ever could.